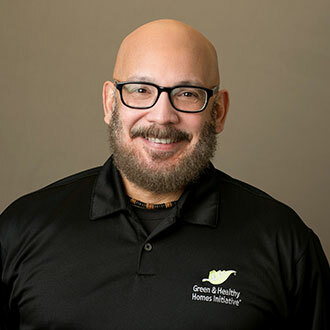 Hector Moreno oversees the Quality Assurance & Quality Control program for Housing Interventions and, as GHHI’s Building Performance Subject Matter Expert, provides technical support GHHI sites in housing environmental and energy matters. Before coming to GHHI, Mr. Moreno worked for 16 years at the U.S. Environmental Protection Agency (USEPA) in Cincinnati, Ohio as a Microbiologist and Environmental Scientist. He later joined the Cincinnati Health Department in Ohio where he worked as an Environmental Health Sanitarian enforcing food safety codes and addressing indoor environmental factors affecting public health. Mr. Moreno holds a Master of Science and a Bachelor of Science in Biology from the University of Puerto Rico. He is fluent in Spanish. He is an active member of the National Environmental Health Association, a licensed Pest Control Operator in Maryland, Mold Inspector, a Building Performance Institute (BPI) Certified Energy Auditor and BPI Quality Control Inspector.